Bill: The English term, liberty, has two meanings. One is an empty point adjacent to a string. Those may be counted by inspection. The other is moves to capture a string. Often the two coincide, but not always. This page gives a basic way to count moves to capture. There are cases where it will not be accurate, but it will work the vast majority of the time. Suppose that we play a game with these rules. One player, the attacker, makes plays in an attempt to capture a string. The other player, the defender, must pass unless he can make a capture. The attacker's aim is to capture the string in as few net moves as possible; the defender's aim is to save the string or to delay the capture by as many net moves as possible. The number of net moves to capture with optimal play is the liberty count. In this capturing race White has 4 liberties. After a play at 5 or 7 would allow White to capture. Black plays first, and then can capture in 2 more moves. This line of play gives the same answer. White makes 4 plays and then Black captures to prolong the game. The number of net plays so far is 3. White makes 3 more plays and then Black captures. The number of net plays so far is 5. White makes 3 more plays to capture, for at total number of 8 net plays. (For Black to capture with would not increase the number of net plays.) So the number of liberties for the big eye is 8. That accords with the saying, Five is Eight. Note that this way of counting liberties is a little funny in this case, because if Black plays first he can live. Similarly, White has 8 liberties by inspection, but White can also live by playing first. However, you can see the utility of this way of counting, because it tells us that whoever goes first can win the capturing race. Mutual life is not optimal. -- firtree (KGS 15 kyu): I found it useful to count not only captures but connections as well. This helps to evaluate stones loosely connected by such techniques as Diagonal jump and Bamboo joint. For example, here the marked white stone has only two physical liberties (shown), and it cannot capture anything with one move later. But it is connected to the triangle stone by diagonal jump that cannot be cut locally, so in tactical sense it has much more liberites. Playing the game described above, we can force white to connect, and now it takes four plays to capture white stones. Capture race is lost by black which has only three liberties after that. So I assume that the marked white stone has at least four tactical liberties. I count 4 tactical liberties for 5 black's plays because white has to answer one move, and can not use that move as a step to capture black. So I count only unanswered attacker's moves needed to capture. You may also think of this as Attacker's moves - Defender's moves, though it is simpler just not to count sequences of moves with answers. For reading purposes I shall also consider the other way of connection, which turns out to be even worse for black: now white has 5 liberties and black has 2. Another example is with bamboo joint. With this scenario white ends up with 4 liberties versus black's 3. Again the other way of connecting should also be considered, which ends with white shape having 5 liberties (black has to make two approaching moves and fill in the false eye last). Though in this method care must be taken since connecting is not always in favor of the defender, and it is up to him to decide whether to connect or not. 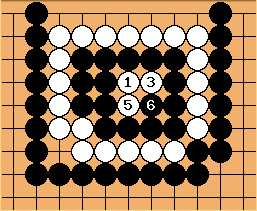 For example in this case if white connects that saves only the marked stone from immediate capture, and that stone is not really important. The important one is the cutting stone , and considering this stone the defender's play is only removing one's own liberties. Doing that, the defender loses the race. So the defender can avoid connection and wait for the attacker to take away all ajacent empty points which will take full four plays, and thus win the race.